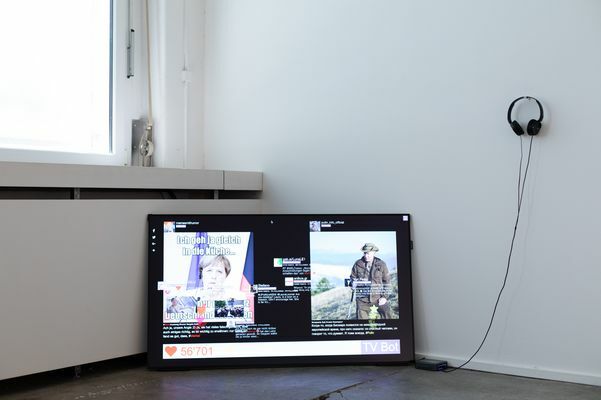 The work 'Political Campaigns - Battle of Opinion on Social Media' is based on Lee's earlier project 'TV-Bot', for which he programmed a Bot to generate an automatic TV show in real time based on the latest Twitter, Instagram and YouTube posts. This new version again generates a TV show, this time focusing on political campaigns. Recently, we have witnessed the inordinate role that social media channels play in fighting out and manipulating electoral campaigns worldwide. What counts today are how many "likes" and "retweets" a post gets - they flicker across the screen in Lee's work, illustrating a politician's current "market value". For several years now, Lee has been grappling with the ways in which social network platforms reflect political debates. For 'Political Campaigns' Lee chooses the format of an interactive, net-based TV show - which sometimes produces surprising results and confronts us with current opinions that exist well outside our personal "filter bubbles".